WHY ADDRESSING YOUR INCOMPLETIONS BRING HAPPINESS? What I mean by incompletions are things you always mean to do or tell a friend you will do but never actually get around to. Depending on your level of integrity, not delivering on your words will affect how you think of yourself. When you are awake, you can pretend all you want that everything is fine, or you can easily put the blame on others. However, you cannot lie to your subconscious mind. Your overall feeling is registered at a subconscious level, and that’s where it affects your self-worth. Imagine you are a cup. Every time you fail to do something that you promised you would do, it creates a hole in your cup. Your energy will leak out through these holes. Over time, you can never feel satisfied because you can never fill up your cup. 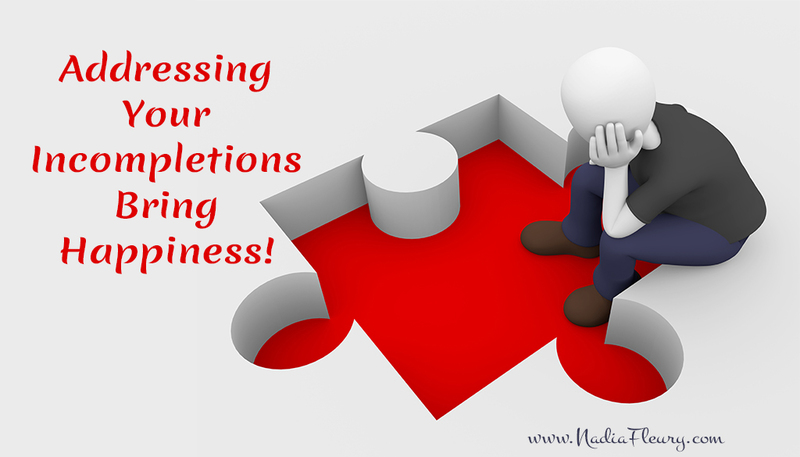 Addressing your incompletions is like patching the holes. If you know you cannot do a certain task that you promised you would do, decommission yourself from the task. Release the trapped energy and also release the other person who is waiting for you. Sometimes an indication that you have too many incompletions is having drama in your life. You will hear a lot of, “But you told me you were going to do this.” Another result of drama is that you keep getting sick. Energy is like germs. You cannot see it, but you can feel the outcome. Sometimes we don’t finish something because we don’t know how or we don’t have the right tools. This is where procrastination comes in. Sure, the task looked easy at first. Have you ever seen those home and garden projects on TV? Somehow TV has a way of making us believe it’s easy. In reality, it boils down to whether you’re interested or committed to seeing the result. And there are no shortcuts. If you wish to lose weight, you’ve got to exercise and watch what you eat. Nobody can do it for you. If you start a project only to see that it’s not your strong suit, and you don’t wish to invest anymore of your time, it’s OK to change your mind, as long as you don’t whine about the lack of results. It’s also a good idea to tie up any loose ends. Sometimes the problem you encounter while working on a new project becomes a blessing in disguise. You may never finish the project you started, but it ends up giving you a new purpose of creating something that solves someone else’s problem. You create something to overcome the challenge that stopped you from doing the task. So many things got invented because of that. Look at all the tools and equipment available on the market that helps you get things done quickly. WHAT STOPS YOU – LAZINESS OR GETTING DISTRACTED BY MORE IMPORTANT THINGS? Let’s go back to why we don’t finish things. Another question to ask yourself is what’s truly stopping you. Is it plain laziness? Or do you stop because something more important comes along, like taking care of a child? In the case of the latter, it’s OK to honor that space. Be OK with just being with your child in that moment. Think of hiring someone to cut the grass so you have more time to go to the park. What I’m saying here is not about what’s right or wrong, it’s about helping you identify what’s important to you. There’s also another reason why we don’t finish things. Once you learn what a project requires of you, you might realize that it’s beyond your capability to handle. A few years back, I spent each weekend of my whole summer scraping away the old paint under the eaves of the house. A few months later, I realized it was too much for me to do alone. It took me two years to delegate the task to a painting contractor. I can tell you from experience that there is power in completing something. I say this because for two years I didn’t feel great about myself. The good thing is, I admitted that the task was way out of my league. So I’m glad I permitted myself to change my mind. What I failed to do was wrap up the loose ends. In my case, that was getting the house repainted. Every time I looked at the unfinished project, I didn’t feel “complete.” It was only when the task got done that I felt the power of seeing something through to the end. Another thing that creates procrastination is never taking the time to celebrate your accomplishments. It’s like, as soon as one task is done, you go back to your to-do list to see what’s next. There comes a time where your brain just says, “Why bother?” When I say celebrate, it doesn’t have to be a huge event. I use a small gesture or a cheer that encourages me to do more. Every time I finish at the gym, I cheer and acknowledge that I’m proud of myself. And I thank God that I’m healthy. There’s one thing I need to bring up again. Your time is precious. So it’s a good thing to consciously assess what your time is worth. If doing X generates $500 a day, but you choose to do chores around the house that you know could be delegated for $80 – well, do the math. You should also focus on what you’re good at instead of being a jack of all trades. As I mentioned in episode three, I spent a lot of time learning to do everything from scratch. All I can say is, if it makes you happy in your heart, go ahead. If you’re only doing it to save money, then you should be asking yourself how you can earn more money so you would have the freedom to delegate the things you don’t like doing. This was my issue, which was rooted in having low standards — I didn’t know I could aim higher, and I also didn’t see my time as being valuable. Sometimes all you need is to ask someone to help you get unstuck. And I know that for many of us, it’s hard to ask others. This is one of the secrets of wealthy people. They build a network of colleagues who work with one another, each focusing on their strong suit. There is wisdom in figuring out what you’re best suited for, so you can delegate the rest. Now, it’s easy to say, but sometimes you don’t know what you’re best suited for until you’re doing it. For me, before getting involved with skincare, I was making leather handbags. It was hard and tedious. I wasn’t good at sewing, and I seemed to spend more time unstitching than stitching. At the time, I was doing it as a way to channel my creativity. But when I started mixing the skincare cream, it came really easily to me. Let’s go back to the idea of saving. Sometimes you have a false belief that you’ll save time and money if you do something yourself. Be mindful of your time in relation to saving money, like trying to change the oil in your car to save $25. Think of all the equipment you need to buy, plus the time you’ll spend under the car. Now, if you love doing it, then it’s perfectly fine. All I’m saying is to discern what’s best for your time because in the end, time is something you can never replace. And, lastly, about procrastination: when you get stuck, give yourself a deadline. Tell yourself that if you don’t finish the task by X, you’ll delegate it to someone else. And be OK with it. Now let’s address what you expect of others. What if you wish for your spouse to finish the bathroom remodel that he started three years ago? Every so often, you nudge your spouse. There is no right or wrong here; it boils down to what works best for both of you. However, I can say that if a project doesn’t get completed in six months, it most likely won’t ever get done. Rather than going the nagging route, I would suggest that you become a little more proactive and get an expert to finish those big projects. 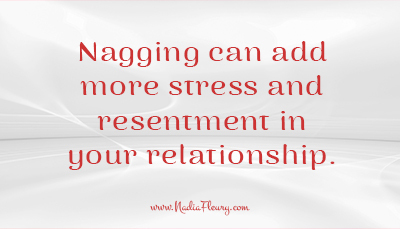 What nagging does is add more stress and resentment to your relationship. It’s best to let go and release the energy. I’m going to share an example of what I mean by releasing the energy. 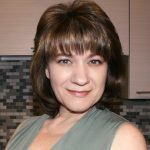 Last May, I hired a social media expert. Well, looking back, her true expertise was coming up with excuses as to why she couldn’t deliver the work. After a while of not seeing the work that I was paying for, I canceled the contract. A few months later, she came back with another invoice saying that I still owed her money for some hours she had forgotten to invoice. I knew I wasn’t going to see any of the work. But her emails were becoming more aggressive. In the end, I decided to pay. I chose to release her with compassion because I knew she wasn’t mentally fit, and I wasn’t willing to waste any more of my energy on her. I’ve learned a lot from her in terms of how to manage my responsibilities when it comes to business. Another element I wish to address – which is close to incompletion – is toleration. What are you tolerating in life that is not supporting you right now? That is draining you? Or worse, sabotaging you? Sometimes these things erode us without us knowing it. 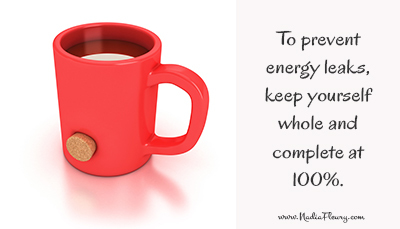 Again, the essential thing is to identify your energy drain. If every time you see something that bothers you and makes you cringe inside, that’s a sign you need to address the issue – whatever it may be. Now, it’s easy to replace or get rid of things. But when it comes to a relationship, that’s something else entirely. I shared my view as a married woman in episode three. However, sometimes it’s our parent or family member that we are tolerating. This is a delicate situation. A friend of mine shared that when he was ten years old, he knew that one day he would have to live his life without his family. They let alcohol control their lives. When he graduated from high school, he chose to live his life on his own terms and chose not to get mixed up in the family drama. It was a hard decision, but he made a choice. If you’re not willing to do something as drastic, you may need compassion and patience for the time being. Bear in mind that “drifters” – which I also explained in detail in episode three — will want you to join them in their pity party. If that’s not where you wish to be, you can create goals that will take your time away from them. Let’s say that every Saturday afternoon you and your family always meet, and you’re no longer enjoying those gatherings. What if you suddenly have a dance lesson on Saturday afternoon? Another thing you can do when you cannot change a situation is changing the story you tell yourself. This new story can help you cope with the situation until you can rectify it. In my case, there is a little three-year-old boy that lives above my apartment. And sometimes he runs, or he plays with a loud toy. Instead of getting frustrated at the situation, I call him “God’s little angel.” And I send him a blessing that he is healthy and can run around. Lastly, there are always some people who want something from you. These distractions prevent you from finishing your own tasks. It’s like when you get a pickup truck and suddenly all your friends need a favor. In this instance, learning to say no might be in your best interest. 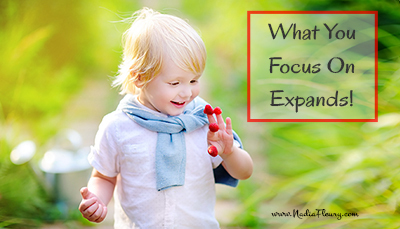 In conclusion, just know that what you focus on will expand. And just thinking about it will not get the task done. So it’s both making a decision combined with taking action that brings results. The takeaway here is to watch the story you tell yourself about your incompletions and what you’re tolerating. It’s your responsibility to discern what you love doing from what you don’t, and to do more of what you love and less of what doesn’t make you happy. Once you know, stop resisting. I’m familiar with the “yes, but,” as in, “You don’t understand me right now, I’m not in a position to address this issue.” I understand why people say this because I said it for so long. Yes, sometimes you have to wait for the timing of the universe. What’s important is how you feel in the meantime. 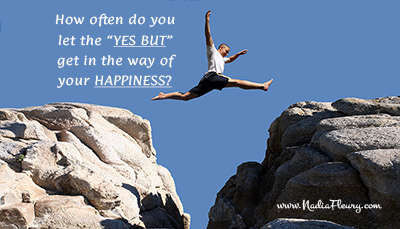 If you resist, and keep coming up with the “yes, but” story, and you go around being miserable, that’s when something needs to change, if you wish to be truly happy. Just know that what you think and what’s on your mind acts like a filter. If you think a certain way, it will erase any other possibilities. If you’re facing a dead end and you say to yourself, “I’m stuck, I can’t go anywhere,” your brain will let you be stuck. Instead, try saying, “OK, I can’t go further in this direction, what other choices do I have?” And as soon as you ask yourself this question, other opportunities will come your way. You may spin your body 180° and realize the door is on the other side. Your mind acts as a spotlight. You only see where the light is shining. And there is never something for nothing. For anything you desire, you’ve got to go after it. And if you don’t know what you desire, take some quiet time and ask yourself. If you say, “I don’t have the time to have some quiet time,” that might be the whole issue. I lost myself in being busy, and this may be your situation, too. Doing things is great, as long as you know why you are doing them. My suggestion is to focus on what you can change. And even if you do something small, it can have a huge impact in the long run. Small and committed actions done over time can bring greater results than any unfinished grand plans. Just remember your biggest why, be mindful of your time, and be committed to being happy. ¹ Hendricks PhD, Gay. The Big Leap: Conquer Your Hidden Fear and Take Life to the Next Level (p. 87). HarperCollins. Kindle Edition.